This section is focused on political and activist art in Central and Eastern Europe, arising out of a post-communist condition. As Dmitry Vorobjev says, “Compared to the Soviet period, nowadays there is more breathing room, but the air conditioners have been turned on, so to speak: the very possibility of thinking about acting collectively in public space is being confiscated. As part of our legacy from the Soviet era we’ve inherited not only the notion that “personal initiative is punishable by law”, but also an aversion to collective forms of action. (…) In our country there are lots of subcultures that are practically invisible in the public and political sphere; the most radical but also the least well represented of these is DIY culture. The very idea of reclaiming space that we’ve been talking about is now simply taboo. 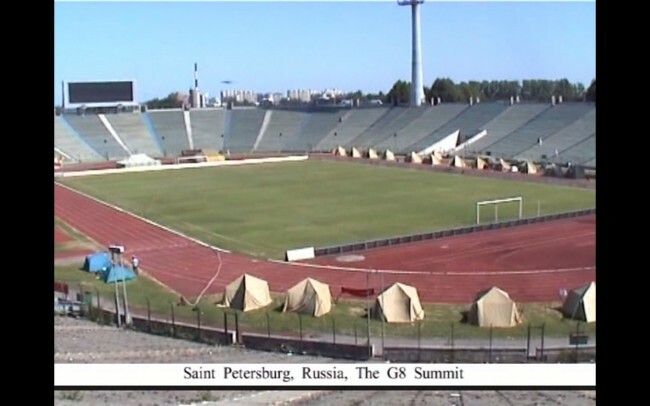 In the past, such practices were also few and far between, but each of them either formed or significantly fortified the subcultures (…) (Reclaim Your Space, or the New Dissidence, an interview with Dmitry Vilensky, published in #12: (Im)possible spaces, newspaper of the platform Chto Delat/What is to be done?, March 2006). Works by: Dmitry Vilensky (born 1964, lives and works in St Petersburg and Berlin), Harun Farocki (born 1944, lives and works in Berlin, Germany) and Andrei Ujica (born 1951, lives and works in Berlin and Karlsruhe, Germany), Nomeda And Gediminas Urbonas (work together since 1993, live and work in Vilnius, Lithuania), Non Governmental Control Commission (A group of young Moscow leftist artists and intellectuals such as Anatoly Osmolovsky, Avdei Ter-Oganyan, Oleg Kireev, active in 1998-99, Moscow), Joanne Richardson. 1) Dmitry Vilensky and Chto delat? /// What is to be done? 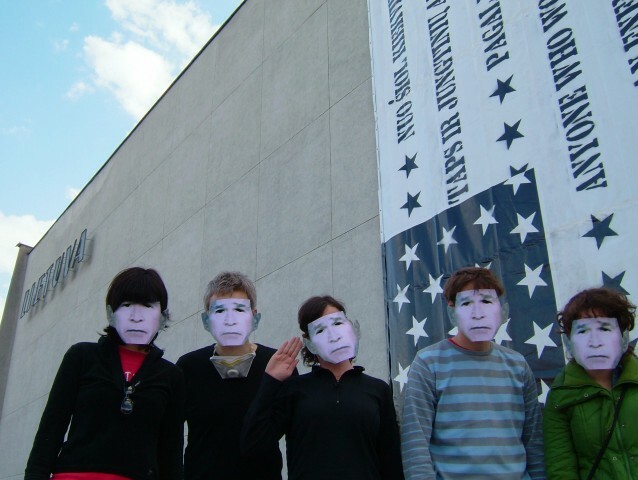 The Pro-test Lab archive collects and disseminates material relating to the community campaign which the artists initiated in 2005 to save the largest movie-house in Vilnius, cinema “Lietuva” which has been privatized and is facing redevelopment. The archive, which includes video documentation of performances, a fashion collection, posters and props, addresses the challenges facing public spaces in the age of proactive capital. Farocki and Ujica’s ‘Videograms’ document the Romanian revolution of December 1989 in Bucharest, presenting a new media-based form of historiography. Demonstrators occupy the television station in Bucharest and broadcast continuously for 120 hours, thereby establishing the television studio as a new historical site. 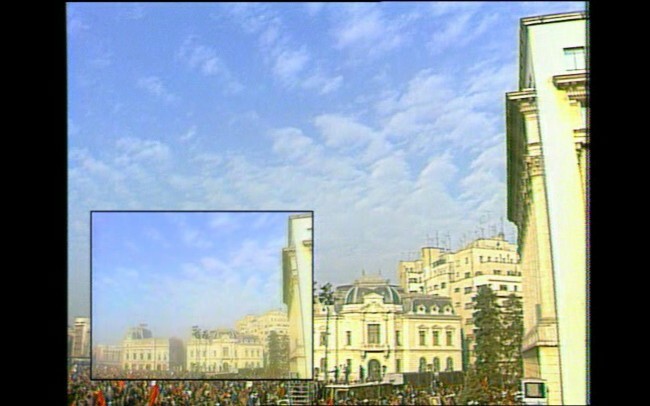 Between December 21, 1989 – the day that Ceaucescu’s made his last speech – and December 26, 1989 – the first televised summary of his trial – home video cameras recorded events at the most important locations in Bucharest. The determining medium of an era has always marked history. Only the videocamera, with its heightened possibilities in terms of recording time and mobility, can bring the process of filming history to completion. Moscow. The Barricadnaya metro station. The pedestrian crossing on Sadovoye Koltso street. Every five minutes the lights turns green – it interrupts the continuous stream of cars and it lets pedestrians cross the street. In the morning you can see masses of people here, who are waiting for green light to cross the street, to reach their offices. Crossing takes a maximum of thirty seconds. It is necessary to make several slogans on red cloth, and in the moment when green light flares unexpectedly, to unfurl them above the pedestrians’ heads, and reach the other side of the street with everybody. You have to do it several times. Effect. All indications of a demonstration are manifested: masses of people, slogans, a central street, traffic is stopped. Marx’s thesis about the genesis of the self-awareness of the revolutionary class, in action. Action within the governmental elections’ 99 in Russia. Traditionally the Lenin Mausoleum in the Red Square was a stage, where known politicians speak and from which the Soviet leadership once viewed parades. Now it is occupied by the group of young artists and anarchists, who proclaimed an “Against all” slogan.